It was Michael Mann directing, just off the out-of-left-field success of Thief and the current irresistible force behind the number one television drama on TV, a pastel wonderland called Miami Vice. It was William Petersen, just off the lead in To Live an Die in LA, and after this role it would be a long time before he’d raise his profile to these heights again, with a little something on CBS called CSI: Crime Scene Investigation. The source material was from Thomas Harris and he was pretty much at his peak when he wrote the book Red Dragon. Hannibal Lecktor (they spell it different in this one) is Bryan Cox, and film fanatic message boards to this very minute pulsate with comments on how his version of the iconic cannibal “wipes up the floor” with Sir Anthony Hopkins’ portrayal of the exact same character in Silence Of The Lambs. I say there’s room for both. It’s a role that begs not be screwed around with, and Cox, with his permanent wince and gum-chewing jocularity, is not screwing around. One can’t say the same for ‘ol Tony in the misguided Lambs sequels. The bogeyman the two are trying to catch goes by the name “The Tooth Fairy” and Tom Noonan’s characterization of this unhinged giant will give you nightmares whether you are 9 or 99. The film is beautifully shot, but that should surprise no one. Michael Mann is sometimes accused of being facile and unnecessarily “pretty,” but why go to movies at all if you don’t want to be accosted by wonderful imagery. Making a Florida beach look staggering is one thing, doing the same for Atlanta and St. Louis quite another. Every frame Mann shoots is mesmerizing. There is a scene featuring a blind woman, a tranquilized tiger and the serial killer himself that is absolutely unforgettable. The soundtrack is top-notch, Mann has always had an innate understanding of how to use music to supplement his vision–not every filmmaker has this gift. It’s not perfect. The overblown role the National Tattler plays in the scheme of things is pretty ridiculous. There is also a cameo by Chris Elliot as a poker-faced G-Man that is as startling and inappropriate as a scrubs-clad Carrot Top bursting into someone’s dying grandmother’s hospital room with a tray of chicken pot pie, veggie mix, and chocolate milk as the family gathers around for her last breath. In the end, when I go to IMDB and look at Michael Mann’s output, I don’t see enough. Thief, this movie, Heat, and of course the two television series Miami Vice and Crime Story are all monumental. Collateral and Ali were silly, the Miami Vice movie completely worthless. I haven’t seen The Insider or Last of the Mohicans. Still, I feel there should have been much, much more. And maybe there still will be–he’s only 71, after all. Er, well, maybe there won’t. 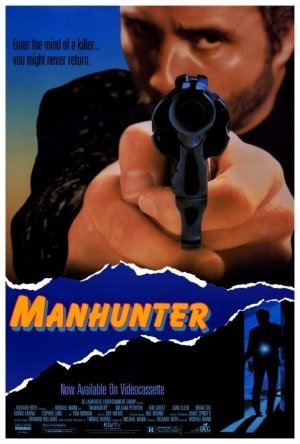 But Manhunter is worth seeking out.